We always try to start the New Year on a healthy note so we have been eating more vegetable-based dishes. The Hubs is a good sport about it but he sometimes misses the main dish being meat-based. 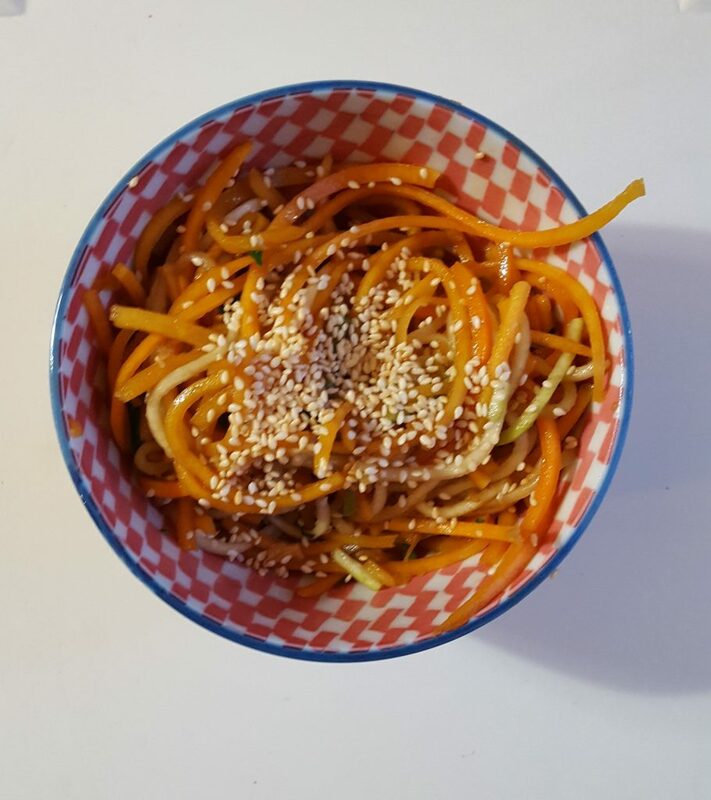 Here’s a new recipe I whipped up that is good as a stir fry for dinner and then as a cold salad for lunch the next day. Place garlic, agave nectar, vinegar, soy sauce and sesame oil in a blender and pulse until garlic is chopped and oil is emulsified. Stir in dried shallots. Set aside. While spirals cook, heat a small skillet and toast sesame seeds 1-2 minutes or until fragrant. Set aside. Turn off wok and toss the spirals with the dressing. Place in serving dishes and sprinkle with sesame seeds. Serve. I used spirals from the Veggie Noodle Co. (Austin, TX). I love their mission statement, that they are USDA organic and that each box came with some pretty cool sounding recipes using fresh herbs and other fresh and raw ingredients: Garlicky Basil Butternut Spirals, Spiralized Butternut with Sage & Veggies, Arugula Salad with Goat Cheese (and butternut spirals), Zucchini Spirals with Basil & Mushrooms, Spicy Garlic-Parm Zucchini with Kale, and even a Sesame Zucchini Noodle Salad. This latter dish I didn’t see until I had whipped up my dressing but I am keeping it close. It’s vinaigrette calls for Tamari, ginger and garlic. Yum! I based this recipe on Sesame Noodle with Broccoli from the archives. Low carbs, low calories and very delicious with that aromatic sesame oil dressing! I’m going back for more spirals today! Love dishes like this that do double duty as a main and as lunch the next day! This looks wonderful — just loaded with flavor. And, of course, healthy — something we desperately need. 🙂 Thanks so much. Since it’s just the two of us, I love to find recipes that can double-duty. We are mainly meatless at home but this week my husband has taken a dislike to pasta dishes. This might work! I’m sure we will get back to pasta but right now it’s off the list. This looks delicious. Oh, he likes pasta but I think I had to many pasta dishes. And to top it off, we gained a little weight but I know we’ll walk it off. 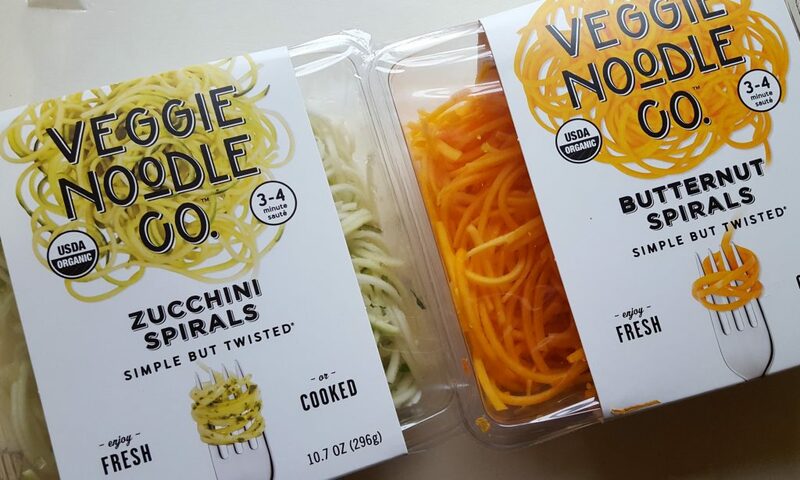 Spiralizing has been pretty popular — interesting that pre-made spiraliized veggies are now available in stores. That was the first time I had seen them. I think they do a sweet potato spiral as well. You can now buy the spirals!? What do they not sell? 🙂 Actually, since I don’t have a spiralizer either, what a great find and what a tasty dish. 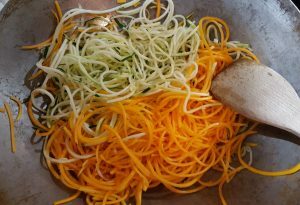 I have a below average spiralizer so I was all over these! I wonder if I can buy these in Denver? I’m officially on the hunt. I got mine at Sprouts. I am sure Whole Foods would have some. I can’t wait to try some in soups.